Take in the highlights of northern Corfu, taking the renowned Corfu Trail. Walk across the island to the coastal town of Kalami and cross the Karst Plateau, passing by remote monasteries and hillside villages to the summit of Pantokrator Mountain. Arrive at Liapades Beach and check-in to our hotel. Situated below the traditional village of Liapades, and surrounded by green hillsides Liapades Beach has a beautiful pebble beach and some small cafes and restaurants. Today's 14 kilometre walk is expected to take around four-and-half hours with 550 metres of ascent; we are transferred to Kalami from the top of the village. Today the real mountain terrain beckons. We transfer by bus back to Spartillas and start our walk: immediately we are on a steep mountain footpath climbing a gully to a fantastic viewpoint at Taxiarchis Chapel - a ruin with fresco-covered walls. We ascend further to cross the Karst Plateau, Corfu's wildest scenery, under the summit of Pantokrator. Then we make our way to the very top, at 917 m, and visit the monastery, with its views across to the mountains of Albania. Descending now with fine views and some rough sections we reach the deserted village of Polie Perithia where we stop at a taverna before we descend the final stretch of the Corfu trail ending at the most northerly point of the island. Our tour ends this morning in Corfu Town (Kerkyra). 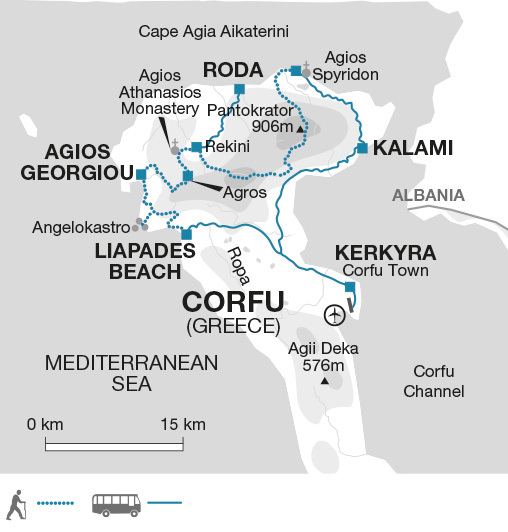 Corfu Town - Allow approximately 15 Euros for entrance fees; Kanoni Peninsula 3.50 Euros. Liapades Beach - Boat trip up west coast (depending on numbers booked) 15 Euros. (6 people minimum) Agios Georgios Wind surfer hire 10 to 12 Euros per hour. Throughout this trip we use a mixture of simple and standard accommodation. At Liapades beach our accommodation is listed as the Cricketer Taverna and Studios. For this night we stay in a variety of studios/apartments in Liapades Beach near to the Taverna. We will use the Cricketer Taverna as a communal base with use of all the facilities there including the hotel's swimming pool. This is where breakfast and our traditional Greek dinner will take place. As with the nature of apartments in this part of the Mediterranean the size and standard of the rooms can vary, the rooms will be decorated in a plain style with private bathrooms and some may have a balcony or terrace. 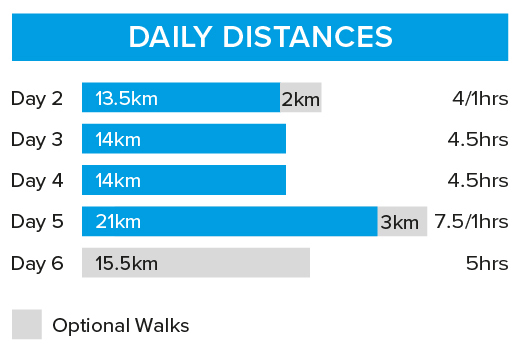 Walk on 4 days for 4 to 5 hours, and up to 9 hours on day 5. Walk along dedicated coastal and mountain paths and old mule tracks.